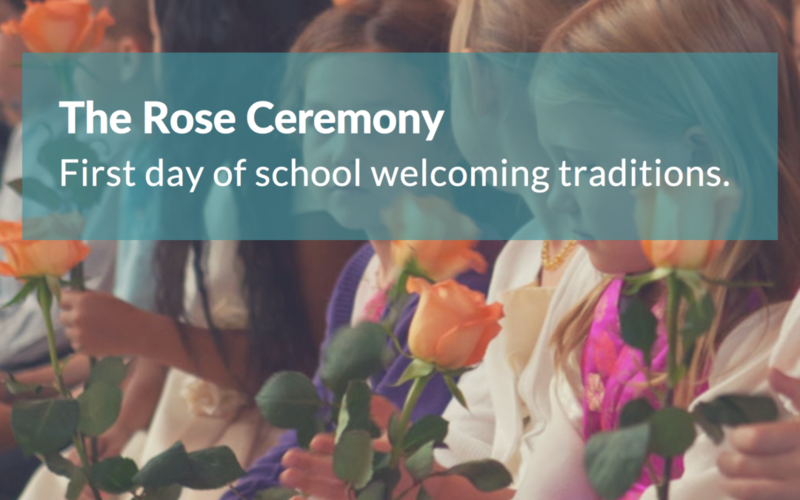 At Roseway Waldorf, like our fellow Waldorf schools around the world, The Rose Ceremony takes place on the first day of School. In all Waldorf schools, effort is made to observe significant moments in childhood and to celebrate these with rituals that have meaning for the children. The Rose Ceremony in Waldorf schools has a long tradition reaching back to the very first Waldorf school. This special assembly opens the school year by drawing a parallel between the Class One beginning their educational journey and the Class Seven who are drawing their Primary School journey to a close. Entering into Class One as a child is a big step. Most children have spent some time in Kindergarten and after this wonderful period are striving to move on, to learn. This transition is an important threshold for every child and their family. It is one step further away from home, one step into the world and towards independence. It is the beginning of a 13-year path after which we endeavour to release these young people into the world as free individualities. As the assembly begins, after all the other grades have taken their seats and the Hall falls quiet, the new Class One children are escorted into the School Hall hand in hand, pared with a Class Seven child as we welcome them into Roseway. The Class Sevens lead the young ones to their seats and as their name is called out by their guardian teacher each Class One child is presented with a single rose by their Class Seven companion. The Class One guardian teacher then tells a story to the whole student body but is specifically intended to resonate for the first grade. The story has significance of the child and the joinery into and are welcomed into School. The Rose Ceremony is a milestone for both grades. The rose serves as a promise of the growth and development that the student will experience in the coming years and symbolises the budding awareness and capabilities of each child as they grow and move from Kindergarten to Class One and throughout Primary School. The young children are entering a new phase in life — where schooling and community will support their budding sense of self, learning and individuality. The older children are entering into young adulthood and are ready to be leaders and guides in their own life and in their community. This reverent event is a reflection of the beauty, kindness and care given to all students, each year, at Roseway Waldorf.